Kristen Shaughnessy is there to deliver news to New Yorkers. 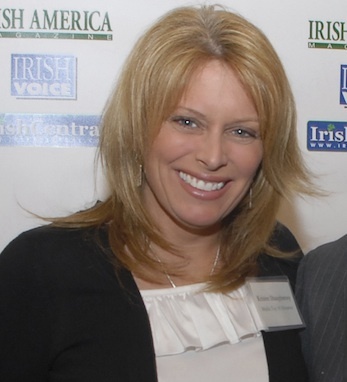 Since 1995, she has been the weekend anchor and breaking-news reporter for NY1. Shaughnessy graduated from Hofstra University with a B.A. in Communications in 1990. She started out in radio and then went on to an upstate NY television station before working for NY1. Ironically, she grew up in a house without a TV. After her family’s television broke, they decided reading was a better option. During the attack on the World Trade Center on September 11, 2001, Shaughnessy was one of the first reporters on scene. She arrived before the first tower fell. Due to the loss of cell phone service, she found the nearest pay phone to report back to the studio. Mid-way through the conversation, she had to drop the phone and run as the tower came down. Shaughnessy is married to professional golfer Joe Bush. She traces her roots back to the mid 19th century, from the southwest of Ireland.